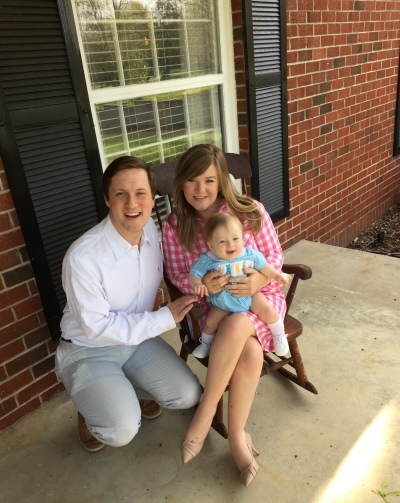 When Palmer Harston Williams was expecting her first child in 2014, she and her husband Joseph knew they needed a new home to fit their growing family. The neighborhood in Nashville that they had their eye on had older homes with lots of character—houses built in the 1940s and '50s, Palmer figures—but they posed some problems. Palmer has used a wheelchair since she was 8 years old, when a car accident caused a spinal cord injury that paralyzed her, and older homes have narrow doorways and lack many other accessible features. But Palmer and Joseph were determined to make their ideal neighborhood work, despite the obvious lack of universal design options. Not only did they like the older homes styles, but this neighborhood would be close to her parents, brother and sister, too. Just what a new mom needs---help from grandparents, aunts and uncles! "I didn't know of any realtor who specialized in accessible housing," says Palmer, "so we decided on our must-haves and what we could adapt ourselves." Palmer, an attorney, made sure someone always came with her to look at houses, in case they needed to help carry her up stairs to look at the properties, and they set aside a budget for home renovations. Century 21 Real Estate is making homebuying easier for people with disabilities like Palmer. In partnership with Harris Poll, Century 21 commissioned a “Persons with Disabilities” survey to gain insight into the current state of accessible housing. After reviewing the results, the brokerage network found a strong need among consumers with disabilities for real estate agents who are trained in, and knowledgeable about, accessible housing. That’s why, Century 21, in partnership with Easterseals, is developing a Special Agent training program to equip their System Members with the necessary skills to further serve homebuyers with disabilities. Dawn Bricker, a Century 21 Advantage Gold broker in the Greater Philadelphia area, is excited to further her experience serving homebuyers with disabilities. Dawn has been helping people find the most functional properties for group homes for people with disabilities for more than 20 years. • Find an agent who is willing to pre-screen homes or do drive-bys to see if the home is worth your time to view. They can also do a quick 30-second video of the outside of the property while they’re at it. • Ramps where you need them, particularly for getting into the house, and/or making sure there is enough room to build a ramp. If there isn’t room for a ramp, then creating room for one can be a much larger expense. • A private space of one’s own, which is crucial for parents or other family members or friends that are moving into your home for care. • Hardwood floors. If a home doesn’t have reinforced wood floors, then consider installing them if there will be extra weight, wear and tear from a wheelchair. And remember, wheelchairs and other assistive devices don’t often work well with carpeting. • For those with a family member with Alzheimer’s or other forms of dementia, a home on a dead-end or cul-de-sac street can be helpful, though isn’t necessary, in case they wander off. Getting to know your neighbors no matter what type of street you live on would be a good idea. Download an educational brochure from Easterseals and Century 21 on accessible housing. Information on a safe home and safe evacuation procedures for people with disabilities and their families.